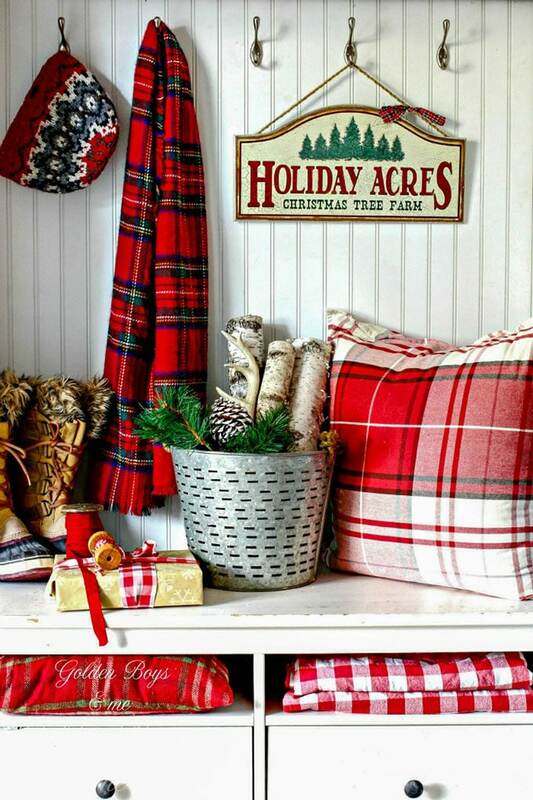 I’m a little bit head over hills in love with plaid Christmas decor this year. It just seems so festive and colorful and criss-crossey! So I wanted to share with you some plaid inspiration that’s been eating away at my mind and occupying my dreams lately. Courtney from Golden Boys & Me has the cutest plaid Christmas entryway. I just want to throw on that scarf, grab a birch log and build a fire. 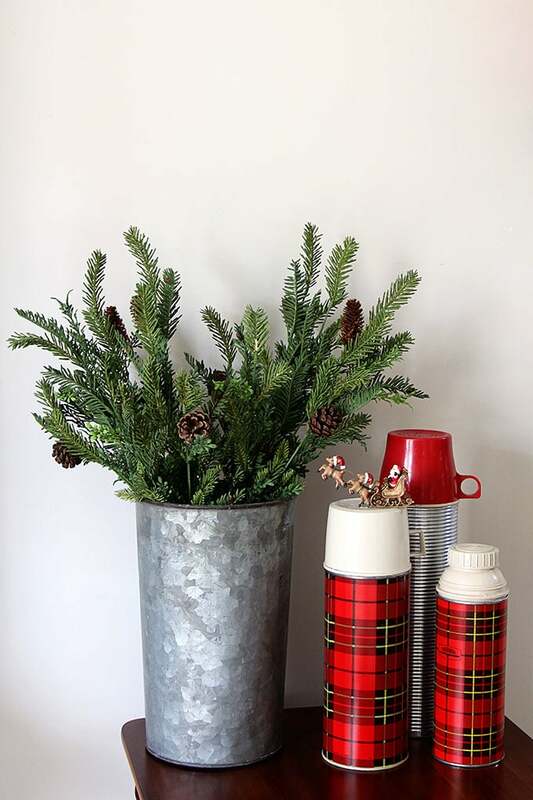 Lucy from Craftberry Bush’s Plaid & Tarten Christmas Tree is the hot diggity bomb. Her deer pillow is super cute also (she make beautiful watercolor prints and I’m pretty sure her watercolor deer pillow is sold in her shop). 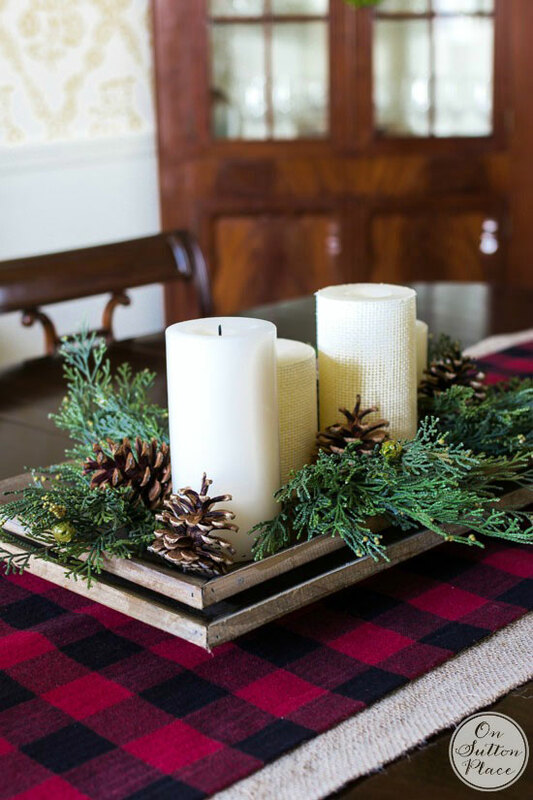 Barb from The Everyday Home has a way with plaid on her mantel. And deer antlers. 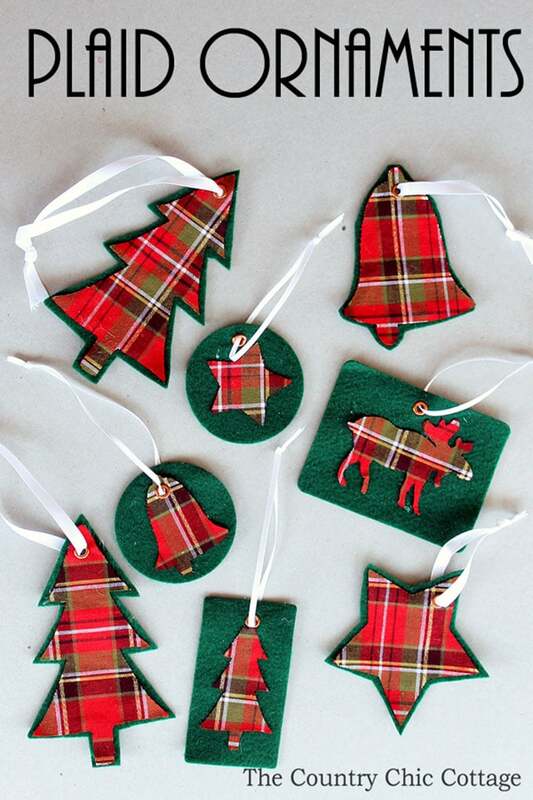 Jessica from Mad In Crafts makes these cute as can be buffalo check rag ornaments. 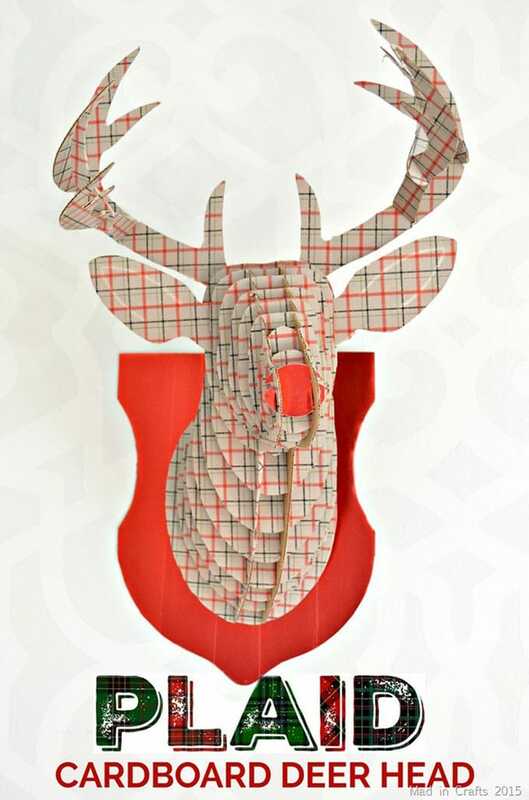 Jessica also made this super cool Plaid Cardboard Deer Head. I see these cardboard cutout guys at the store all the time and I never once thought to fancy them up! This free buffalo check Christmas printable from Maria at Pastels & Macaroons is a quick and easy way to show off your plaid side. 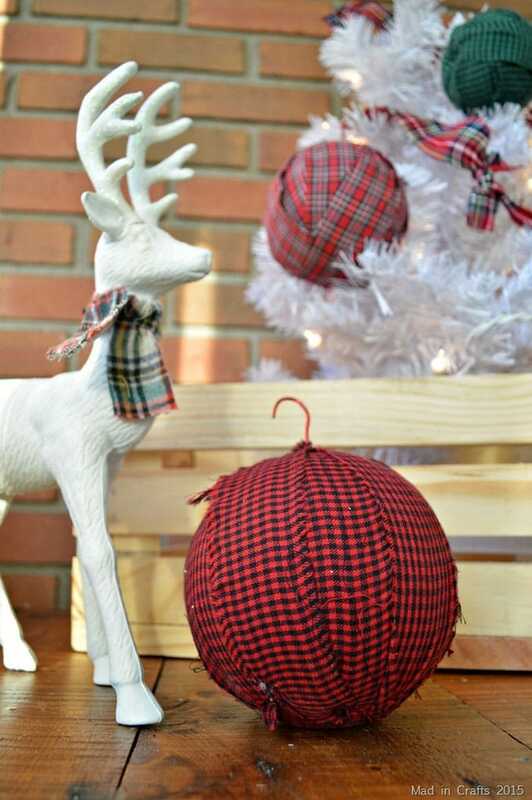 And Angie from Country Chic Cottage shows us how to make these super easy plaid Christmas ornaments. 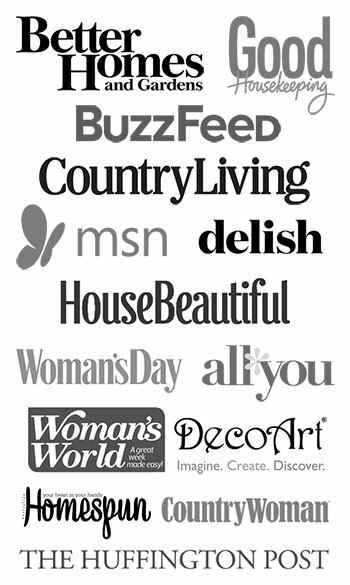 That’s what I love about Angie’s site – everything is quick and easy and something even I can do. Because if I can’t finish a craft in an afternoon, it’s just not getting finished (said the girl who is still working on finishing an upholstery project started in the last century). And last but certainly not least, I have Ann from On Sutton Place‘s no-sew buffalo plaid table runner. You had me at no-sew, Ann! Now, I’m no slouch at plaid Christmas decor myself. Although I’ve never gone over the top, shout it from the rooftops, mad for plaid in my Christmas decor, I have been known to throw it in here and there. 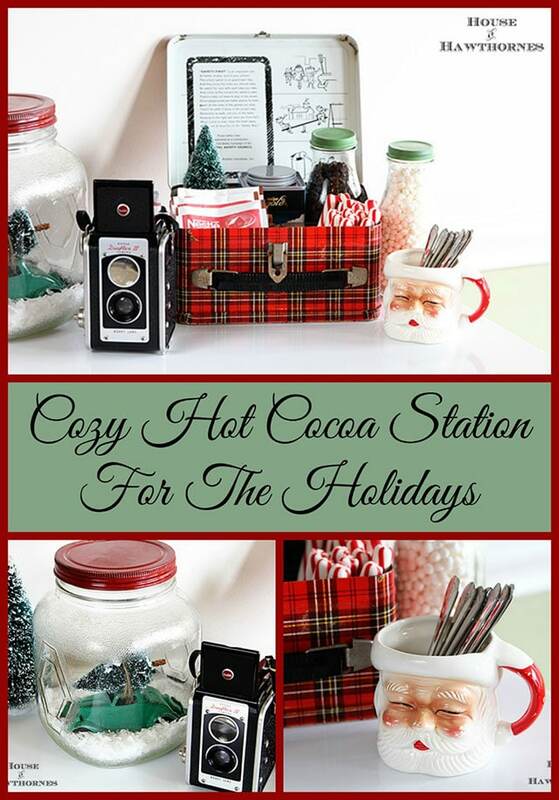 Like my plaid school lunchbox used as a cocoa station. And my thermoses. You can’t forget thermoses when you start talking plaid! You can see them here in my Vintage Eclectic Holiday Home Tour from last year. 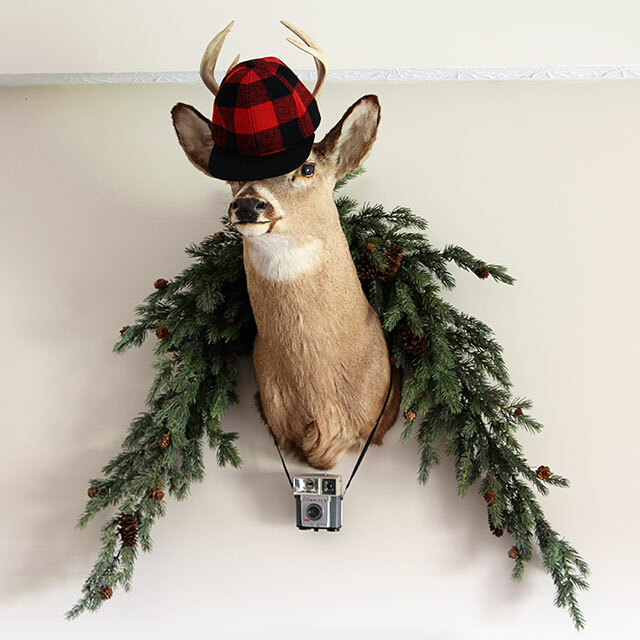 Even my friend in my Vintage, Rustic, Industrial House Tour from the previous year was sporting a little plaid. Get it. Sporting. He’s a deer . 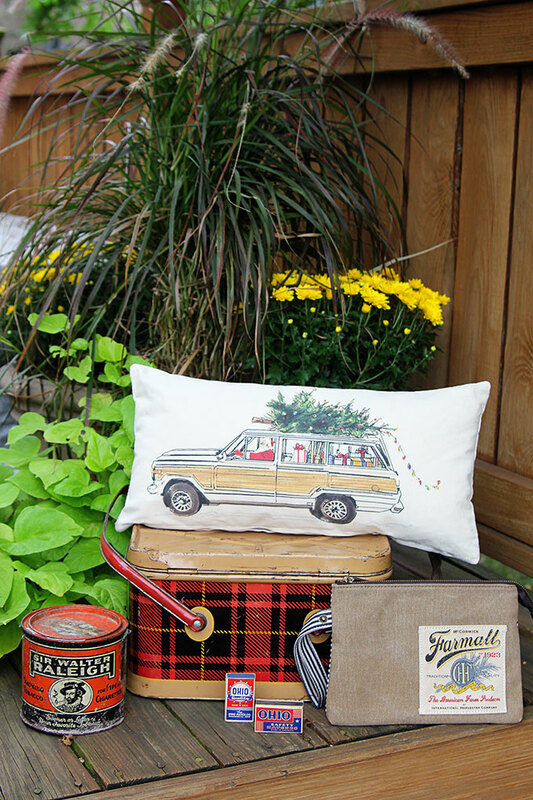 . .
And of course there’s the plaid tin picnic basket I bought at the Country Living Fair this fall, which is sure to find its way into my holiday decor this year! So I guess I do decorate with some plaid already. I’m just toying with the idea of kicking it up a notch or twenty this year. What about you? 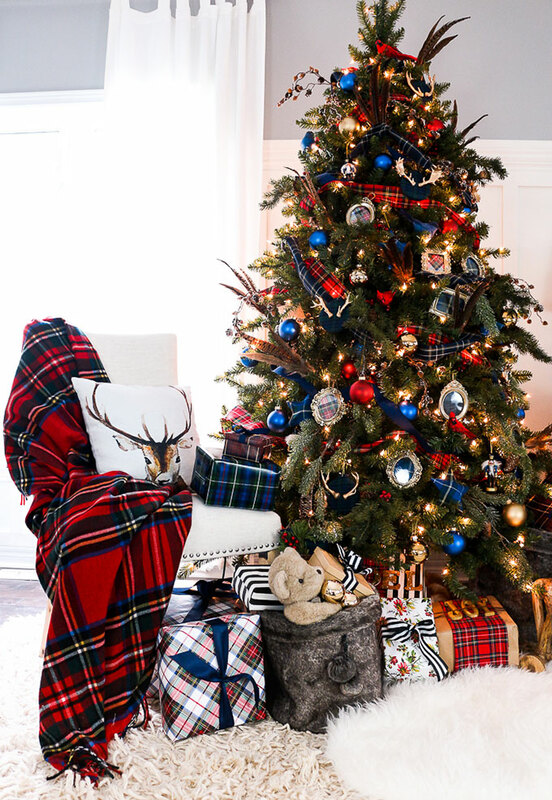 Are you mad for plaid Christmas decor? Love it! 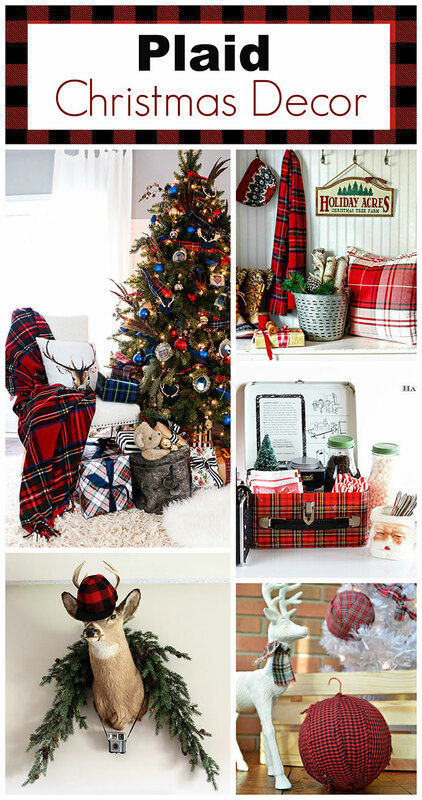 So many great plaid inspiration ideas…love the ornaments! Yes…I am using some plaid…and I bought a red plaid poncho recently! Oh how I adore red plaid! 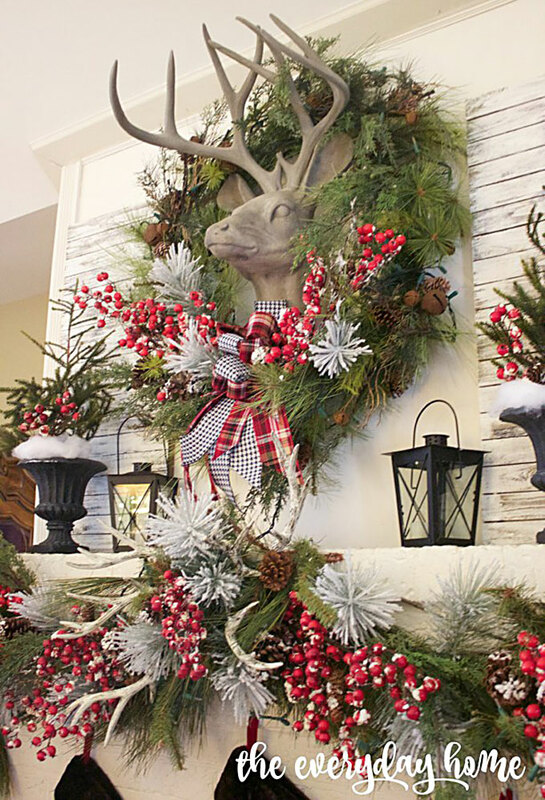 Thanks for all the fabulous Christmas decorating inspiration! When I went on my Christmas tour of decorated shops they had lots of plaid ribbon and decorations. I was on the hunt for black and white check, no luck. So you will be in style with plaid. 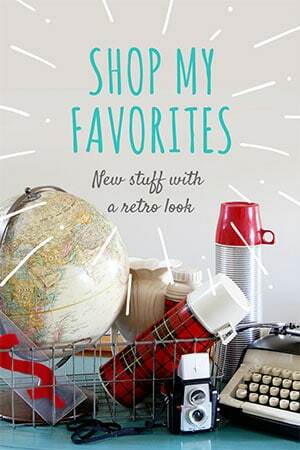 liked all the items on your post. Good luck finding your plaid. I adore red plaid for Christmas and tartan year round! These are fun photos and I’m getting some great inspiration from them! 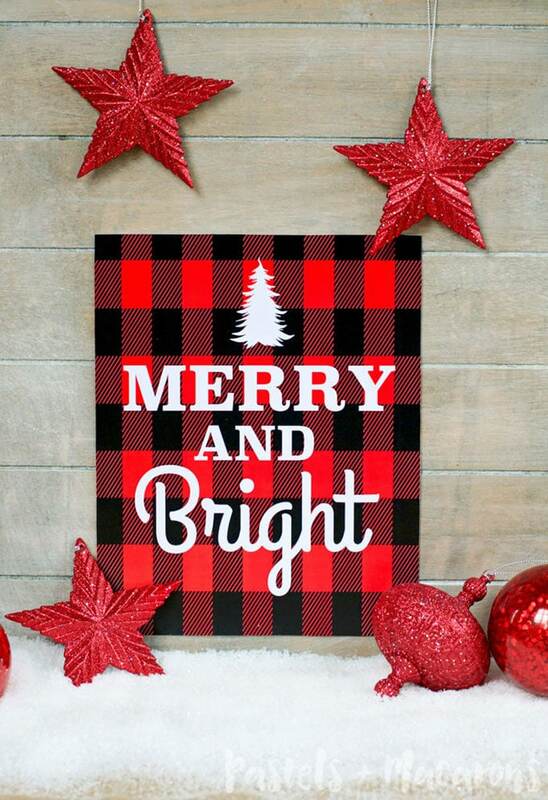 Red, plaid….what’s not to love?! Fun and festive inspiration photos! Yeah, is that a for-real typewriter, Pam? Or did you paint a black one?! Just kidding. My first typewriter which I got when I was in high school was pastel green. Wonder what happened to that? It was cute; wish I still had it. Plaid. Ah, well, I’m not crazy about most plaid, but I must say, it is a rather festive accent in Christmas decor. It wouldn’t be what I would use for my own holiday decor, except maybe in very small doses. I do think the plaid ribbon on the Christmas packages is really pretty, though. You never know, maybe the plaid idea will grow on me and by next Christmas I’ll be using it, too! A lot of plaid cuteness here, Pam! I don’t think I have any plaid. Will have to try and add some. I certainly have always loved gingham, a close cousin. These are all so cute! Not usually plaid what I would choose, but love the richness and colors in the pictures. Thanks for stopping by the party. Fun post Pam! It’s got me thinking…what do I have in plaid? I’m in the middle of cleaning out, which is the wrong time of year…LOL! I should be doing Christmas, but I’m not yet.